Return evenly spaced numbers over a specified interval. 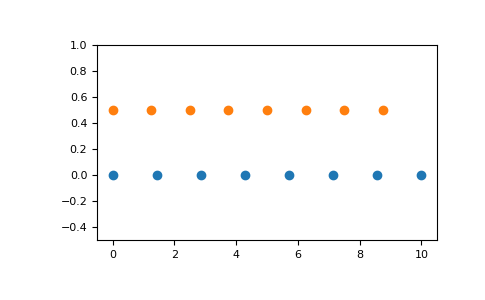 Returns num evenly spaced samples, calculated over the interval [start, stop]. The endpoint of the interval can optionally be excluded. The starting value of the sequence. The end value of the sequence, unless endpoint is set to False. In that case, the sequence consists of all but the last of num + 1 evenly spaced samples, so that stop is excluded. Note that the step size changes when endpoint is False. Number of samples to generate. Default is 50. Must be non-negative. If True, return (samples, step), where step is the spacing between samples. There are num equally spaced samples in the closed interval [start, stop] or the half-open interval [start, stop) (depending on whether endpoint is True or False). Size of spacing between samples. Similar to linspace, but uses a step size (instead of the number of samples). Samples uniformly distributed in log space.